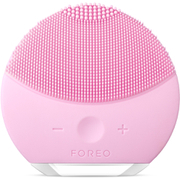 A luxurious skincare experience, the FOREO Night Cleanser eliminates excess oil, dirt and impurities. 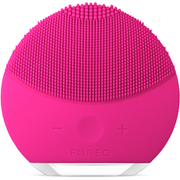 For a high performance ritual, the absorption of the cleanser is enhanced when used in conjunction with the T-Sonic™ pulsations of FOREO's LUNA™ device, allowing it to reach deeper into pores, removing pollution, make-up and dead skin cells and revealing a refined, healthy-looking complexion. Suitable for all skin types, its unique formula transforms from a silky gel into a velvety milk and utilizes precious Meteorite Powder to detoxify skin, leaving you with a touchably soft texture and luminous glow. With 97% ingredients of natural origin, the cleanser is infused with Moringa extract to diminish pollution particles, whilst Sweet Almond Oil deeply nourishes, soothes and smoothens skin for restored radiance and increased suppleness. Use as part of your evening routine. 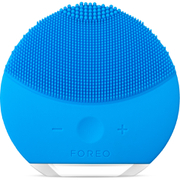 Apply cleanser to face or your LUNA™ device. Cleanse your face with gentle motions and rinse with water. Prunus Amygdalus Dulcis (Sweet Almond) Oil, Coco-Caprylate/Carpate, Glycerin, Water, Sucrose Laurate, Sucrose Palmitate, Meteorite Powder, Moringa Pterygosperma Seed Extract, Helianthus Annuus (Sunflower) Seed Oil, Microcrystalline Cellulose, Benzyl Alcohol, Parfum/Fragrance, Chlorphenesin, Mannitol, Tocopherol, Synthetic Fluorphlogopite, CI 77019/Mica, CI 77891/Titanium Dioxide, Hexyl Cinnmal, Limonene, CI 77499/Iron Oxides, Alpha-Isomethyl Ionone, Maltodextrin, CI 75470/Carmine, CI 77492/Iron Oxides, CI 77510/Ferric Ferrocyanide.